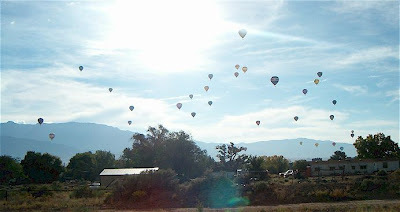 This year for Balloon Fiesta, John and I took the dogs for a ride from Rio Rancho down into Corrales in the early morning to observe the mass ascension. I often describe this event to people as "candy in the sky" because of the rich and varied colors. 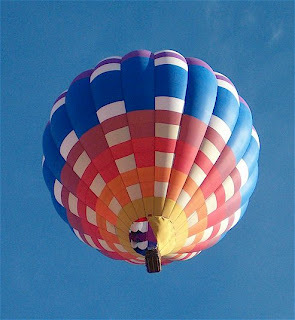 Generally, dogs and horses react negatively to balloons nearby. I've been told it is the sound of the gas going through the baffels that sets them off. Stinky never used to bark at the balloons. In fact, he used to just sit and watch them go by, but with Chica prone to barking at anything that flies, he has a tendency to get caught up in the action. 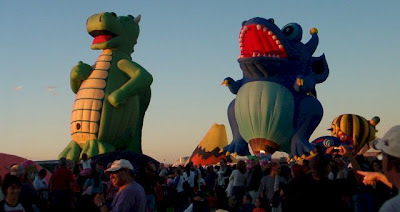 Each year, Thursday and Friday nights host the Special Shapes Glowdeo at the Balloon Fiesta Fairgrounds. This year we went, had a dinner of fair-food (hamburger, hotdogs, nachos, flavored lemonades) then visited the chainsaw carving contest and exhibits. The crowds at the carving site were deep and it was difficult to fully enjoy the carvings, but there was a display and sale tent that had really interested and intricate carvings. We walked back to the middle of the field. John and I bought funnel cakes - two to be exact. Next year, we'll know better - one is plenty! We stuffed ourselves, and still were unable to finish them both. As the sun sets, the balloon teams lay out their balloons and inflate them. 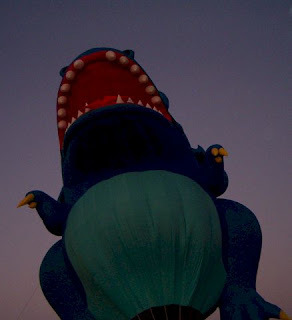 At dusk, the pilots gas fire the balloons in synchronization, lighting the balloons from the inside for the crowd to enjoy. We particularly like the Special Shapes due to the creative variety. This year we had a haunted house, Darth Vader, a couple of different flying pigs, a clown fish definitely not called Nemo, a bumble bee, ristra, giant beer, and many many more. 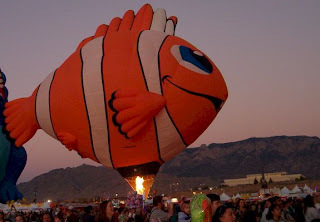 Balloonists come from all over the world to take part in the Balloon Fiesta. During the Glowdeo's, pilots often hand out trading cards with images of their balloons and facts about country of origin, size, etc. Sadly, each year I've been in New Mexico, there have been accidents. With the large numbers of balloons in the air each year, it's expected. This year was particularly tragic. As John and I were walking out of the Fiesta with the intent of enjoying the firework show from our patio, we noticed and enjoyed the inverted triangle balloon. The very next day it was blown into wires, its propane tanks catching fire and the co-pilot died. In true New Mexican tradition, the pilot's wife's vehicle was broken into at their hotel the following night and all of there personal property was stolen too. We are horribly saddened by these events.